Report Updated April 18: At a session April 16, the sides remained at odds over pensions. Further cancellations would kill Muti concerts. 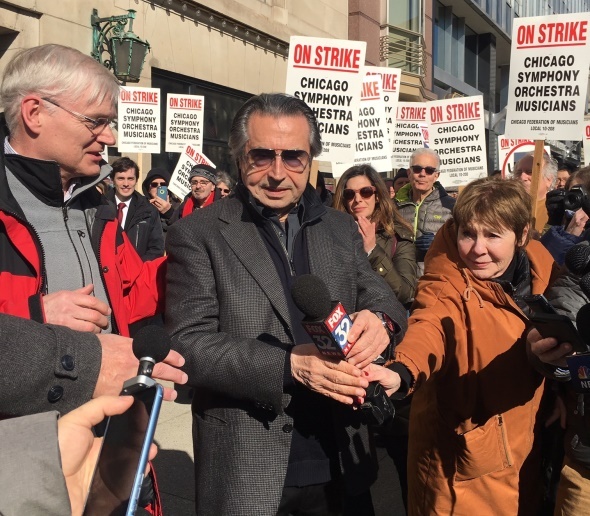 After a negotiation session April 16 proved fruitless between the striking musicians of the Chicago Symphony Orchestra and the Chicago Symphony Orchestra Association, the Association on April 18 extended its cancellation of events through the end of the month — or two days before the first scheduled concert in music director Riccardo Muti’s return for two weeks of performance with the CSO. Civic Chamber Music concert at People’s Music School on April 24. CSO subscription concerts April 25-27 with conductor Nikolaj Szeps-Znaider and cellist Gautier Capuçon. Symphony Center Presents pianist Simon Trpčeski on April 28. Civic Orchestra of Chicago concert on April 30 with conductor Nikolaj Szeps-Znaider. On April 8, asserting that the “last, best and final” offer from the Chicago Symphony Orchestra Association would leave the orchestra’s musicians “further behind the orchestras of Los Angeles and San Francisco, the CSO musicians voted to reject the proposal. 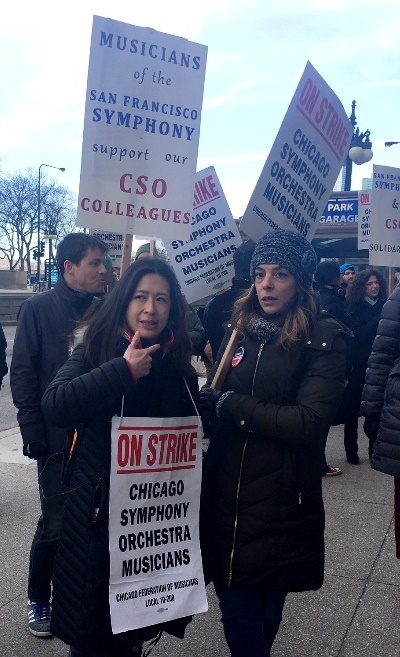 Musicians of the San Francisco Symphony Orchestra walked in support of the striking CSO in front of Orchestra Hall in March. CSO All-Access Chamber concert, a free performance by the CSO Chamber Players on April 10. CSO subscription concerts April 11-13 with guest conductor Emmanuel Krivine and pianist Benjamin Grosvenor as soloist in his CSO. The concert featuring this program at the Krannert Center in Urbana, Ill., scheduled for April 16 is also canceled. Symphony Center Presents the Monterey Jazz Festival on Tour 60th Anniversary Celebration on April 12. Brazilian folktale, on April 13 and April 15. Civic Chamber Music concert at Indian Boundary Park on April 13. Civic Chamber Music concert at the National Museum of Mexican Art on April 14. Symphony Center Presents violinist Midori and pianist Jean-Yves Thibaudet on April 14. The Latino Alliance 5th Anniversary Celebration scheduled for Monday, April 15 has been postponed to a future date to be announced. been postponed to a future date to be announced. CSO subscription concerts April 18 23 with conductor Fabien Gabel and pianist Emanuel Ax. Civic Chamber Music concert at the Zhou B Art Center on April 19. 5-year agreement vs. a (former) 3-year agreement. Salary increases each year of 2 percent, 2 percent, 2 percent, 2.5 percent and 3 percent, reaching an annual minimum base pay of $178,152 in the final year of the contract vs. the 1 percent, 2 percent, 2 percent, reaching an annual minimum base pay of $167,094 in the final year of the contract. A phased transition of the retirement plan for current members of the Orchestra. Each musician can select from two options (July 1, 2020 or July 1, 2023) for the date of their transition from the Defined Benefit (DB) pension plan to a Defined Contribution (DC) plan, depending on what best suits their individual needs. Until then, they can continue to earn benefits under the DB plan. more than $90,000 in the first three years of the transition. security of their annual benefit in retirement.